Describe the evolution of the iconography and form concerning the depiction of this scene. Use these works as specific examples, do some comparisons. 1. 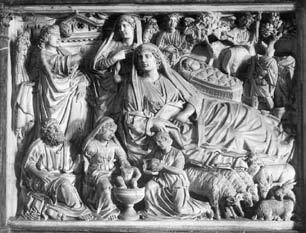 Nativity by Nicolo Pisano in Italy of 1259. 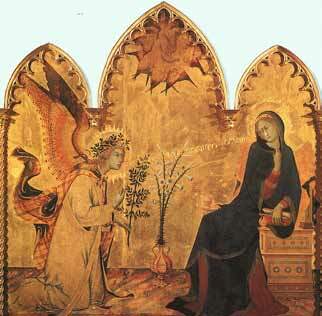 This scene is like the annunciation because Gabriel is telling Mary that she is going to have a baby. There are 3 wise men and a baby that have no head/hands. Mary is wearing drapes which shows she is jew/muslim. Joseph is is the step dad in the left corner and this sculpture represents continuous narrative. The picture also has sheep in it and the Baptism of Jeses. 2. 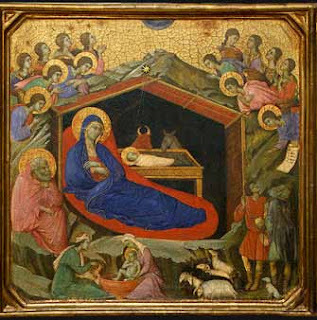 The Nativity with Isaiah and Ezckiel by Duccio in Washington DC if 1308. The info is the same as the first picture. 3. Announciation by Sitnome Martini of Italy in the 19th C. It is still the announciation if where Gabriel is telling Mary she is going to have a baby. The olive branch means peace, the pot of lily flowers means it is a holy vessel. Mary is holding a Bible and she has the halo light on her head. In this painting, it shows arches. In the center arch shows holy spirit that are doves. 4. 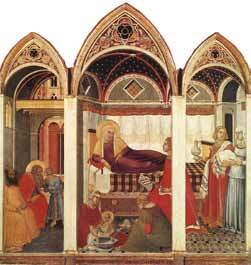 The birth of the Virgin by Pietro Lorenzetti in Siena of 1342. This time, Mary has had her baby. The maids are giving Jesus a bath, but we dont know if it is a baptism. On the left frame is Mary's family. Mary's family is the only ones that have a halo on their heads. We noticed that the vase has no flowers in them as well. Also, in this painting shows gothic arches. Mary is wearing a head covering that is part of being a pious person in most cultures. In this instance it probably an indication of Jewish tradition. Mary was not Muslim. Martini's the pot of lily flowers means her womb is the holy vessel and the flowers are pure white to indicate the pure flowering that springs from her womb. The Lorenzetti is the birth of the Virgin Mary so Jesus is not in the picture at all. It is a change on the them because the scene dates from Mary's childhood and birth. The figure of St. Anne replaces that of Mary in this scene and Mary's father (Joachim) is in the place where Joseph would be seen in other depictions.